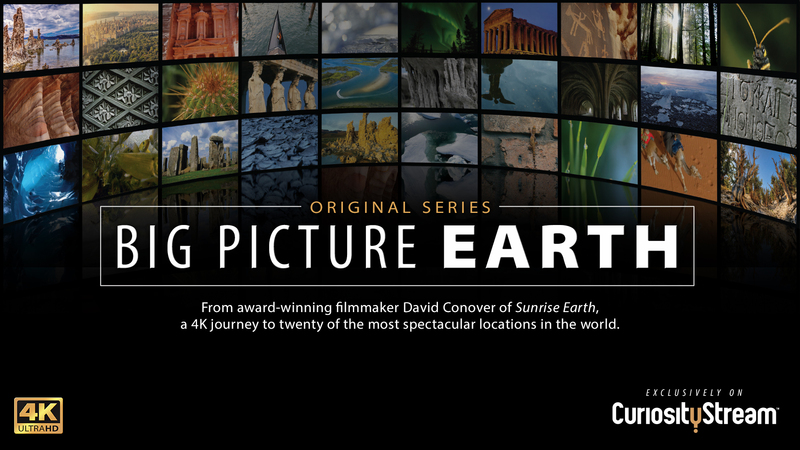 CuriosityStream is taking viewers into the natural world with the premiere of original production the 20-episode BIG PICTURE EARTH series that will entertain and educate viewers with brilliantly sharp 4K footage. CuriosityStream is the premiere online destination for ad-free, on-demand nonfiction documentaries from around the world. Starting today, the global streaming service introduces 50 original 4K Ultra HD titles to the streaming service to be available soon. CuriosityStream offers worldwide streaming subscriber access at affordable monthly rates for SD ($2.99), HD ($5.99) and now 4K ($11.99). Discounted annual pricing plans are also available. First 30 days are free. Preview CuriosityStream’s documentary library by visiting app.curiositystream.com. 4K streaming is available on Amazon FireTV and Roku 4 devices. Created by the founder of the Discovery Channel, CuriosityStream is the world's first ad-free, on-demand streaming service for quality programs that educate, inspire and entertain. The SVOD service delivers an extensive library of nearly 1,500 high-quality documentaries and series worldwide, available whenever and wherever you want to watch on multiple devices. Watch CuriosityStream on Amazon FireTV, Roku, Amazon Prime, Chromecast as well as Android and iOS devices. Learn more at http://www.curiositystream.com and join the community of the curious on Twitter @CuriosityStream.